This was something of a "clear the kitchen" soup. I had some frozen bluefish from North Carolina that I knew I should use sooner rather than later, along with two russet potatoes that had been kicking around in the cupboard. 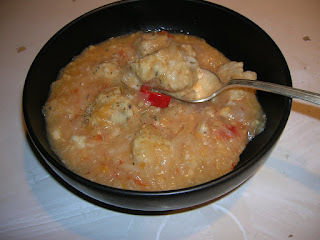 Six or so years ago I made a Czechoslovakian fish soup that I really enjoyed, but never made again. It was interesting; mild and light, but thickened with shredded potato and crushed tomatoes. This gave it a slightly rouge-ish color. With great joy, I realized I could make the soup again with everything I had on hand. The only thing I didn't really like about the fish soup was the fish. The recipe instructed you to cut thin fillets of white fish into 1" pieces, lightly saute them, then add them to the soup to cook through. It made sense; sauteing them first would add some extra flavor and browning. But the thin fillets immediately fell into flakes as soon as you stirred them into the soup. By the time you poured the soup into serving bowls, the fish resembled the shredded potato. But what if you made them into dumplings? 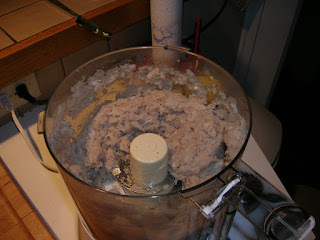 I figured the frozen bluefish wouldn't survive much handling once thawed, so I had no qualms about tossing it all into the food processor. I borrowed a recipes for Quenelles, which are like the French version of Jewish gefilte fish. Gefilte fish are dumplings made out of pureed fish and dough, served in a thick, aspic like jelly. Think crustless fish McNuggets. 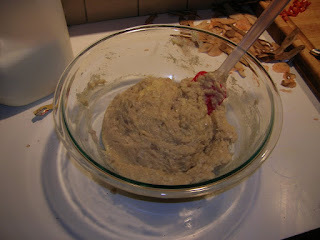 To start, I brought a small amount of flour and butter to a simmer and tossed in flour to make something like a loose roux. You could just combine these ingredients cold, but then they would have a raw flour flavor, like undercooked biscuits. So don't do that. Once the flour mixture had slightly cooled, I beat in two egg yolks. Separately, I pureed about 2 lbs of blue fish fillets with the egg whites, 1 tsp dried tarragon, 1 tsp herbs de Provence, 1/2 tsp white pepper, 1/4 tsp thyme, 1 tsp baking soda (for a lighter dumpling) some milk, a garlic clove, and some white balsamic vinegar. Combine both mixtures and fold together like you were folding egg whites into a souffle. The soup started out by frying up some bacon (homemade, if available), then frying up a chopped onion. I added 1/2 bottle of sauvignon blanc and an equal amount of water. Two tablespoons Marigold vegetable bouillon, some oregano, and a bay leaf added some backing flavors. I simmered the shredded potato for about 30 minutes, then added a pint of whole peeled tomatoes and cooked for another 15 minutes. To make the quenelles/dumplings, just use two wet spoons and form little spheres. Then plop them in the lightly simmering soup and poach for 10 minutes. Then add in one of those Fresno chilies that make everything taste so good and spicy. The soup kept very well and was still tasty five days later. The blue fish tasted very mild as quenelles and I'd happily pick it again, over something like tilapia. And frankly, the quenells were pretty easy to make, like forming drop cookies. I can see that technique carried over with other types of seafood. Shrimp quenelles sound pretty tasty, especially in something unexpected like a gumbo. I toyed with the idea of oyster quenelles, but I think they'd just turn to goo in the food processor. If you try it, report back for me.